Pest description and damage The adult male is brown to gray and about 1 inch across and flies during the day in search of the wingless female moth. 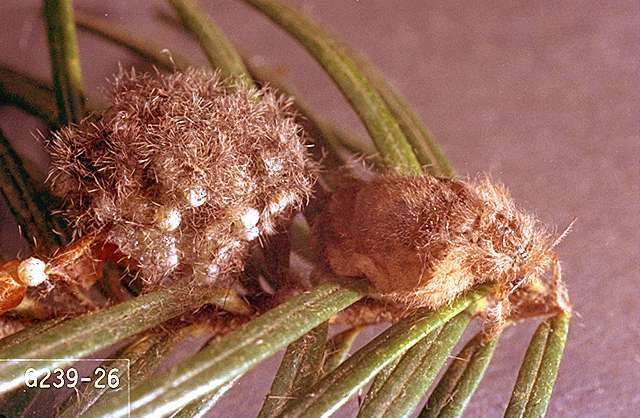 The larvae feed on pine needles and the mature larvae are about an inch long, hairy, gray or light brown, with black heads. They are distinguished by three long tufts of black hairs on their body (two in front, one in back) and shorter dorsal tufts along their back. The hairs from tussock moth caterpillars break off easily and may cause skin or respiratory irritation. The larvae start at branch tips at the top of the tree and work down, feeding mainly on the new foliage and causing severe defoliation. The preferred hosts are Douglas-fir, grand fir, and white fir, although it also may be a problem on spruce, pine, true fir and larch. They feed mainly on forest trees and are infrequent pests in the landscape. Biology and life history The insect overwinters as egg masses deposited on or near the cocoons of the wingless female. 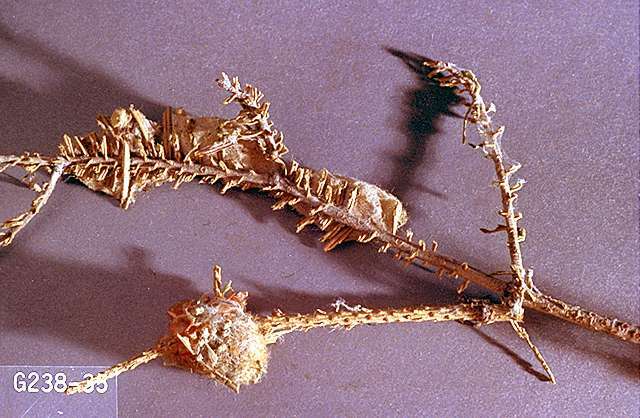 The larvae emerge in the spring as buds break and begin feeding on the new growth. The insect pupates in cocoons on the host plant, and adults emerge in summer. Males seek out the flightless females which look like a grayish bag with legs. There is one generation per year. A variety of predators and parasitoids keep this pest under control most of the time. 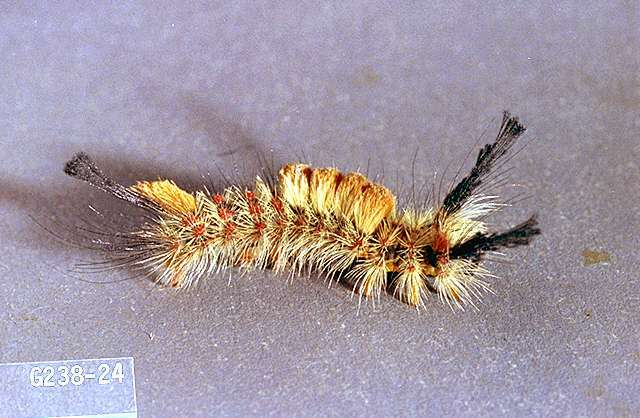 Severe tussock moth outbreaks are sporadic and tend to last about three years before subsiding. Prune off and burn infested branches. Do not touch caterpillars with bare hands as some people are sensitive to their irritating hairs. Hand-pick caterpillars preferably while wearing gloves. Avoid rubbing your eyes as hairs can penetrate the eyeball causing intense pain.